BINGHAMSTOWN, or SALEEN, a village, in the parish of KILMORE-ERRIS, barony of ERRIS, county of MAYO, and province of CONNAUGHT, 3 miles (S. E.) from Bellmullet: the population is returned with the parish. This place is situated on the eastern shore of the peninsula called the Mullet, and consists of one long street indifferently built: it commands a good view of Saleen bay, in which a landing pier has been erected by the late Fishery Board, where considerable quantities of corn and potatoes are shipped for Westport, and various articles of merchandise are brought back. A fair is held on the first day of every month throughout the year; there is a market-house. Petty sessions are held in a court-house every Thursday; and here is a constabulary police station. The parish church, a neat plain edifice, is situated in the village, in which is also a H. C. chapel.-See KILMORE-ERRIS. 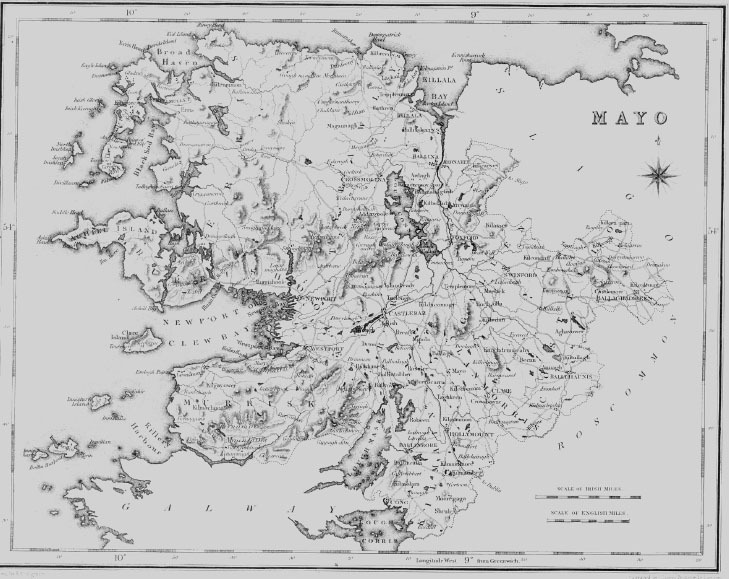 DEVLANE, or DAVILANE, an island, in the parish of KILMORE, barony of ERRIS, county of MAYO, and province of CONNAUGHT, 14 miles (S. W.) from Belmullet: the population is returned with the parish. This island is situated off Blacksod bay, on the western coast, about two miles from the extremity of the peninsula, called the Mullet : near it is a smaller island, called Devlane-beg. KILMORE-ERRIS, a parish, in the barony of ERRIS, county of MAYO, and province of CONNAUGHT, 3 miles (S. S. W.) from Belmullet ; containing 9159 inhabitants. This parish forms the remotest district of the mainland of Connaught, and extends for more than 15 miles from north to south, including the principal portion of the peninsula called the Mullet. It is separated from the parish of Kilcommon by the town of Belmullet, and comprises 29,160 statute acres, of which 13,950 are applotted under the tithe act and valued at #5558 per annum. The lands are chiefly arable, with a considerable portion of good pasture, and a large tract of mountain and bog ; the soil is light and sandy, and the inhabitants are much annoyed by the drifting of the sand, which is of so penetrating a quality as to find its way into the interior even of watch cases. The system of agriculture, though backward, has been greatly improved under the auspices of the Very Rev. J. P. Lyons, D.D., of Binghamstown, who has employed great numbers of poor labourers in reclaiming the wasteland and bogs. The land towards the coast is exposed to violent storms, which frequently destroy the potatoe crops, and involve the poorer peasantry in all the miseries of famine. Considerable quantities of barley and potatoes are sent to the markets of Westport and Newport, when the crops escape injury from the western blasts, to protect them from which the ridges are made in a direction from north to south ; quite low on the eastern, and raised about two feet on the western side. The chief manure is sea-weed and shell sand, which are found in abundance on the coast. The cattle fed here are of very inferior quality, though the pasture is tolerably good ; the fences are of very rude construction, consisting only of a few sods ; and the dwellings of the farmers seldom contain more than one apartment, formed of stone at the base and of sods above. The peasantry subsist chiefly on sea fish of various kinds, on shell fish found on the coast, and on sloak or layer which they gather from the rocks. On the northern shore are some quarries of stratified granite of a very beautiful description, and of good quality for building, but it is not worked, on account of the difficulty of conveyance to any port ; and on Tarmon Hill, near the southern extremity, are other quarries of granite, from which was raised the stone for building the pier at Blacksod haven. Iron ore is also found in various parts and in great abundance. The principal seats are Bingham castle, the residence of Major Bingham ; Binghamstown, of the Rev. J. P. Lyons ; and Bay View, the property of W. Biagham, Esq. The parish is washed by the Atlantic on every side except the east, where it is separated from the mainland by Blacksod bay, and on the north-east, where it is bounded by the bay of Broadhaven ; the isthmus between these bays,. which is not more than 200 yards in breadth, can be approached only through a tract of wild mountainous country. On the western side of the peninsula are numerous rocky islets, of which the two largest are North and South Innisken ; and off the north-western extremity, about four miles from Erris Head and 1? from Scotch Port, the nearest harbour for boats, is Eagle island, a sharp rocky height comprising about 15 acres. of which 12 are covered with rich grass and 3 are barren and rugged rock. On this island the Ballast Corporation of Dublin, under the direction of Government, have erected two lighthouses, at an expense of #30,000, both displaying bright and steady lights visible at a great distance. The stone of which they are built was partly brought from Kingstown, near Dublin, and partly quarried on the island; and the buildings contain convenient dwellings for the light-keepers. Between Blacksod Point, at the southern extremity of the peninsula, and Saddle Head on the island of Achill, is the entrance to Blacksod bay ; and to the eastward are the entrances to the bays of Tulloghan and Bullane. Blacksod harbour is very spacious and much to seaward, extending boldly into the Atlantic, and within it works to any extent might be constructed for the security of vessels taking shelter ; it is separated only by a narrow isthmus from the harbour of Broadhaven. The best anchorage is on the west side of the bay, about ? of a mile from Barnach Isle , in 4? to 5 fathoms of water ; but vessels not drawing more than 10 feet of water may ride farther up in 2 to 2? fathoms. The anchorage on the north side of the peninsula of Cleggan, though less exposed than in the open bay, is very indifferent ; vessels drawing 10 or 12 feet must go up at half tide, as there is only 9 feet off the western side of Cleggan at low water ; the rocks at the north side of the anchorage are dry at half ebb. From the peculiar situation of these harbours and the abundance of fine granite fit for engineering purposes which the immediate neighbourhood affords, this might be rendered a highly advantageous station for steam communication with North America. A pier has been built at Saleen or Binghamstown, which affords great convenience for shipping large quantities of agricultural produce, for which merchandise is brought back in exchange ; and a small expenditure in completing the inner dock would make this harbour more extensively useful than it is at present. A pier has also been constructed at Tarmon, of granite from the quarry on Tarmon Hill, at an expense of #1000 granted by the Board of Fisheries ; and about 20 hookers of 6 tons each, and 100 yawls, are employed in the fishery off this coast, which is carried on by persons who are also farmers ; there is a small landing pier at Belmullet. Nearly opposite to Eagle island is the headland of Annagh, projecting boldly into the bay ; and about half a mile to the west of it is a shoal called Monaster Ladizi, over which the sea constantly breaks with great violence. Fairs for live stock are held at Binghamstown on the first day of every month ; there is a constabulary police station, and petty sessions are held weekly at that place and Belmullet, each of which is described under its own head. The living is a vicarage, in the diocese of Killala, and in the patronage of the Bishop ; the rectory is appropriate to the precentorship of the cathedral of Killala. The tithes amount to #260, of which one-half is payable to the precentor and one-half to the vicar. The glebe-house was built by a gift of #450 and a loan of #180, from the late Board of First Fruits : the glebe comprises 40 acres. The church, a neat plain edifice with a square tower, towards the erection of which the same Board gave #200, in 1820, occupies a very elevated situation at Binghamstown ; the Ecclesiastical Commissioners have lately granted #138 for its repair. The R. C. parish is co-extensive with that of the Established Church ; the chapel, a large edifice, is situated at Binghamstown, and there is another chapel also at Tarrane. About 130 children are taught in a national school, and there are five private schools, in which are about 170 children. Near the glebe-house is a remarkable subterraneous cavern, called Pullinashantina, into which the sea rushes nearly a quarter of a mile, with extreme violence and noise: the rock is singularly formed, and part of it has fallen in, leaving a wide gap which adds to the awful grandeur of the scene. Near the cavern is a detached mass of rock that appears to have been severed from the other portion by some violent convulsion, and on the summit of which is a rich field of grass. In that part of the peninsula called the Mullet are some ruins of the small monastery of Cross, or the Holy Cross, which was dependent on the abbey of Ballintobber ; and nearly buried in the sands are some of the walls of an ancient church, said to have belonged to a nunnery formerly existing there. On the shore of Broadhaven are the small remains of Knocknalina castle ; and about four miles from it, on Blacksod harbour, are the ruins of Barnach castle, a square building of small dimensions. About a mile and a half to the north-west of the Mullet is Coulogh castle, and on a bold headland opposite to Eagle island are the remains of the ancient fort of Dunamogh. On the island called Innis Glora is an ancient burial-ground, which is still used as a place of interment. There is a very strongly impregnated chalybeate spring at Binghamstown.